The Mets win two in a row! The Mets (6-8) won their second in a row and third in four games, and Pelfrey has been a big reason. In his previous appearance, on Saturday, Pelfrey got the first save of his career when he pitched the 20th inning of a 2-1 victory in St. Louis……. Can they get men home? As in the last few years…They just leave too many people on base….. But I need the team to be healthy AFTER THE ALL -STAR break! Reyes went 4 for 5 in support of starter Mike Pelfrey (3-0), who pitched seven innings to extend his scoreless streak to 19 innings. Reyes, who missed almost a year with hamstring and thyroid problems, started this season a week late and did not start Monday’s game, a 6-1 victory. When Manager Jerry Manuelscratched Reyes then, he said Reyes needed a rest as he struggled to get back his timing and sharpness. Reyes was hitting .150. But Manuel also predicted “the next time you see him on the field, you’ll see some things you haven’t seen before” this season. Ain’t this crazy!…I’m happy for just two wins???? 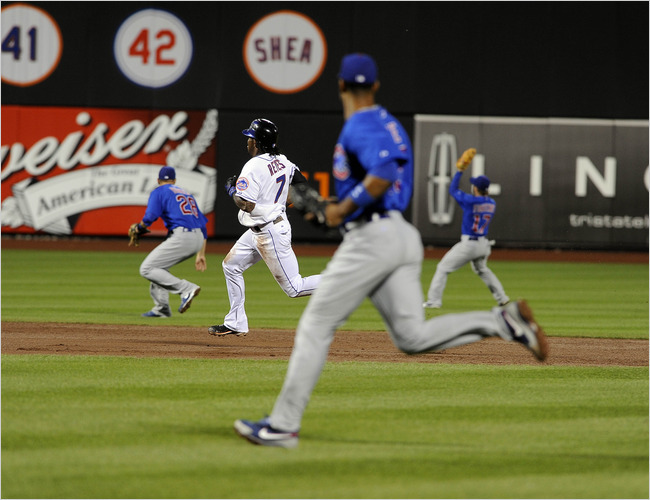 Jose Reyes on his way back to the Mets! According to a team spokesman, Reyes’ thyroid levels have returned to normal, less than two weeks after the Mets said they expected him be out anywhere from two to eight weeks because of elevated thyroid levels. Reyes had been at home in New York, under doctors’ orders not to exercise until tests cleared him. His return gives him less than two weeks to be ready for Opening Day, and GM Omar Minaya was cautious in speaking of that possibility. “As far as Opening Day, we don’t know,” said Minaya. “We’ll see how Jose comes along. We’re going to have to build his stamina up, and where he’s going to be in two weeks, we don’t know.